The modern Criminal Injuries Compensation Scheme (CICS) was introduced by the Government under the Criminal Injuries Compensation Act 1995. It is administered by the Criminal Injuries Compensation Authority (CICA). Report the incident immediately. If you have sustained severe injuries, a relative or friend may be able to help you. Report the incident fully and to the police. It is essential your injuries and evidence are formally reported and you must insist all is on record. Seek medical care and treatment, if needed. Co-operate fully with the police and with the CICA. Your attacker does not need to have been apprehended, taken to court or convicted. If the CICA is satised that there is a qualifying injury as a result of a crime of violence your application can still succeed. 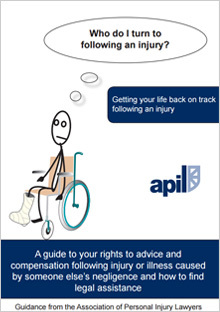 If your application is successful you will receive compensation for physical or psychological injury or both. If you are offwork for more than 28 weeks, compensation may also be awarded for loss of earnings and special expenses, for example care or special equipment. Where a victim has died as a result of a criminal injury you may be entitled to compensation if you were the partner, parent or child of the victim, or if you have paid the funeral expenses. Advice is available from organisations such as the CICA or Victim Support. You may decide, however, that you need independent legal advice and representation. Many personal injury lawyers have full knowledge and understanding of the terms and conditions of the scheme and the procedures required by the CICA. This type of representation is not paid for by the CICA. If your conduct contributed to the incident and your injury or if you have a criminal record, the CICA may take this into account, when assessing your claim, although you may still be entitled to an award.